Restart 182T New Door Fit | Tennessee Aircraft Services, Inc.
Fitting a new door on a hand made airframe is always full of interesting challenges. Words like drilling, filing, bending, cussing (or at least thinking about it), de-burring, chamfering, repeat, always have some part in the process. 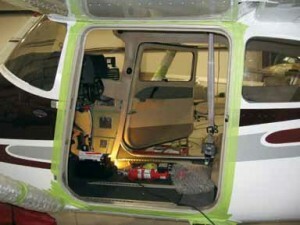 This applies whether fitting a gear door, baggage door, or cabin door. There are many reasons for the level of difficulty involved and why every door & frame combination presents a different set of problems.I’ve fit used doors on used airplanes before with the understanding that it won’t be a particularly good fit. Installing factory new doors on an almost new 182T requires a much higher level of precision and carries an expectation of a higher quality fit. The current production 182T cabin door is a very strong and The current production 182T cabin door is a very strong and fairly rigid bonded aluminum assembly. Primarily, it is made up of the hydro formed aluminum frame and the slightly curved outer skin bonded together. 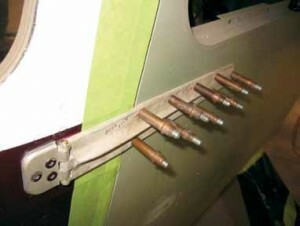 The older series of the legacy planes had the same basic components but were riveted together. The major changes in the doors over the years are in the latching mechanism. All are manufactured with the outer skin over sized enough to allow trimming to fit the cabin. The design for the cabin door opening is almost unchanged since the beginning of production of the legacy planes through the current production restarts. On the assembly line the opening in the cabin is undersized so there is enough material for some trimming to fit the door if needed. During production, the door is set in place and skin material is removed from the door and some from the cabin until a continuous equal gap exists all the way around the door. There’s no specific formula or pattern so once a door and airframe are cut, they are a uniquely matched set. Most of my experience with cabin door replacement is fitting a serviceable door from a salvage yard to an older airplane. The door could be made to fit and operate, but the gaps around the edges would vary from 1/16″ to 1/4″. Usable, but not as aesthetically pleasing as one would like. Seldom does one get to fit a new door on an old airplane. Even less frequently does one get to install a new door on a (almost) new airplane. During the fitting process, the new door is placed in position and removed again many times. The trim and fit is a fairly intimidating process because an over cut ruins a $5,000 + door, so a very gradual approach is called for. 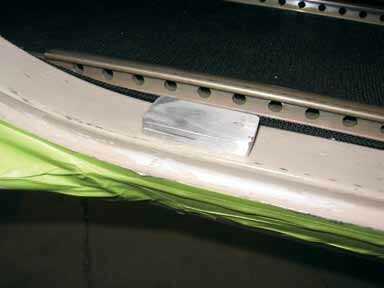 To allow for temporary cutting and alignment marks, a strip of 2″ wide tape is placed on the exterior cabin skins all the way around the door opening. 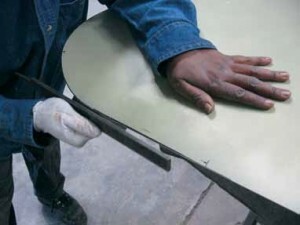 This will also protect the aircraft paint from being damaged by the repeated placement of the door. I suggest covering the wheel fairing and wing strut as a precaution against paint rash as well. A 0.400″ thick spacer in place on the door seal to help the initial placement of the door. center of the retaining bar on the aft cabin door post and the door latch release pin should just about center on the black striker plate. The door is held in this position while a tracing is made around the door skin (definitely a 2 person job) onto the masking tape previously applied to the cabin opening perimeter. A few radial marks are made on the door and cabin as well, to ensure installation in the same location on subsequent installations. The door is removed so measurements can be taken from the tracing to the edge of the cabin skin. These measurements are then transferred to the door skin so we’ll know how much to trim. In a perfect world, the door skin will overlap the old door opening all the way around. Hand filing with a vixen file. Always file to a mark. If the mark is filed away all reference is lost and excess material will be removed. The leading edge of the door is trimmed to fit first with about a 1/16th” gap to the cabin skin. The upper and lower front corners are trimmed next. At this point the front of the door should fit inside the cabin opening. The hinges are bolted to the cabin and swung into contact with the door while in the closed position. With the door held in this position (another 2 person job) the new hinges can be drilled to fit and secure the new door. The hinges are pre-drilled and countersunk from the factory.Be certain to check the depth of the countersink as they are often over cut. If the rivet is below the surface of the hinge the rivet set won’t make contact with the rivet and the security of the mount will be compromised. Once in position, one hole at a time is drilled and clecoed until all are completed. 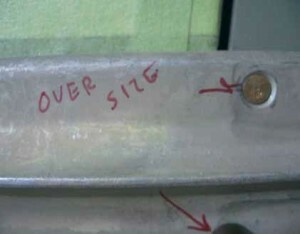 A Cleco is a temporary fastener used until the rivets are installed. Upper hinge drilled and “clecoed” in place. The door is now locked in position so it can be opened and closed with assurance it will land in the same place each time. The trimming process continues until the door can be closed with the same 1/16th” gap all the way around. If the new door’s outer skin was not quite large enough to cover the cabin opening there may be some areas where the gap is larger than the 1/16th”. In those areas there would have been no trimming of the new door as all the material would be needed to give as small a gap as possible. The forward half of the lower door hinge at the pivot pin radius is not rounded on the inboard side. This “corner” may rub on the new door skin when the door is swung open. This may be resolved by dressing the “corner” of the hinge pin area or notching the door skin. I prefer a slight trimming of the hinge. The hinge rivets can now be installed as the majority of the door trimming is complete. The cabin frame striker plate assembly must almost touch the door frame as the door closes. This is accomplished by adding shims of aluminum stock under the striker plate mount. These shims are fabricated in the field and installed as thick as needed for the desired effect. After all the trimming, fitting, and de-burring are done the door comes off again for painting. The door is installed again for installation of the seal. Painting and proper seal installation is fodder for a future article and beyond the scope of today’s discussion. I suspect you’ll probably never need to know any of this. I thought it valuable to understand the level of craftsmanship and tenacity required to make a door fit properly. In the end, it’s all arts and crafts kind of stuff. The T.L.A.R. System is absolutely the best approach. (T.L.A.R. ? That Looks About Right). Precision is important but not the kind achieved with rulers or micrometers. Installing the door just to function is easy enough but the real work is getting it to look right. A ruler is just going to muck it up.